I make tables and use hanger bolts to attach legs. On the lighter tables (3/4" pine for instance) I have been using two 1/4" hanger bolts to attach each leg. On the larger or heavier tables (1"+ thick pine or oak, etc.) I use 3/8" hanger bolts. On those too I have been putting two hanger bolts for each leg. I just made a bench from 1"+ poplar and used just one 3/8" hanger bolt for each leg. it seems to be sufficient. However, the legs are only 17" long and so there is less torque on the hangar bolt. My question. Would a single 3/8" hanger bolt suffice for tables with say 3" square legs 29" long? Or is it safer and sounder to continue to use two bolts? 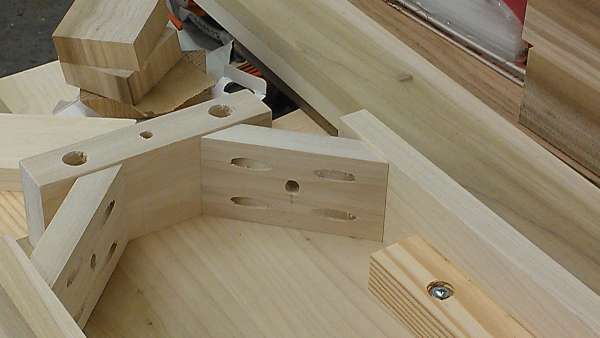 I have attached photos of the corner brackets I use on all table and some benches. The first is a bench and the second a table. The hanger bolts are configured vertically (when I use two), about 1.5" apart. I would stay with the two bolts without question. I see some awesome care in your joinery. Very nice.